Card 14 using the new Rainbow Butterflies Digikit. This card uses Rainbow Butterflies set 10. 1: Create a dark brown square in your graphics programme approx. 13.5 cm x 13.5 cm. 3: Import the floral paper, re-size to approx. 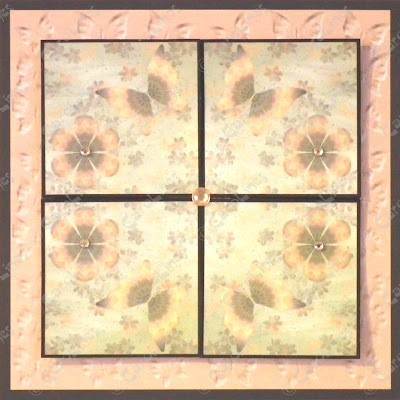 5.25 cm square. 4: Import the butterfly and flower, re-size and position them as illustrated on the floral square. vertically, so you have 4 with the butteflies and flowers in a circle. 6: Print the 4 squares and the card on to good quality card. 7: Use a Versamark inkpad and a clear powder to emboss each floral square. square so that part is more raised then the inner corners. 9: Embellish with gemstone and glitter if wished.